So, you like tempeh, eh? My love story with tempeh started a few years back during one of my trips to Whole Foods. It was amazing to see the many packets of hash brown-like substance that does not taste anything like jelly at all! What was more interesting is the way the crowd purchased it one after the other like there was no tomorrow. Like there was going to be a tempeh shortage anytime soon. After the crowd has dispersed, I told myself, why not taste it? I know tempeh is quite a staple food for vegans. If non-vegans eat it as if it tasted like salty, flavorful chips, well then it might be worth a try, right? After my first bite into that supple and squashy, brown rectangle, I never stopped. I finished two full blocks of tempeh, standing up! I never even thought of what health benefits tempeh can do for me. You could guess by now that tempeh is one of the most, if not the most, popular vegan food to ever grace the history of mankind. Why is it so popular and why are you and I so attracted to it? Here’s a couple of the many health benefits that you can get from munching on tempeh. Tempeh has a lot of proteins. And when I mean a lot, I do mean a lot. The protein content in tempeh makes up 20% of it! If you consume 100 grams of tempeh you get at least 19 grams of protein. That is almost the same of what chicken has, sans the calories. If you eat 100 grams of chicken breast, you do get 21 grams of protein, but you also get 64 mg of cholesterol. Tempeh also provides enough calcium and iron that you need daily. In fact, when compared to milk and chicken liver, tempeh is almost at par with these food items. For every 100g of tempeh, you get 11% Calcium and 15% Iron while milk has 11% Calcium and chicken liver has 71% Iron. And as if it needs more emphasis, it can decrease bad cholesterol levels in the body. Tempeh is cholesterol free, so you can eat as much as you can without worrying about your cholesterol levels spiking up. Tempeh has enough phytoestrogens, particularly isoflavones, to get those red flushes and mood swings out of menopausal women! Talk about an instant cure. Not only that, this component is also known to lower cancer risks in women. You may be part of the eat-tempeh-or-die party or the other half of it that refuses to put these kinds of food items inside your bodies. Perhaps now that you have learned how tempeh can be a great alternative for meat but still get the same, if not more, benefits, you may want to try a quick bite. And no, you don’t need to head to Whole Foods, just a trip to your local grocer or health food store will do. 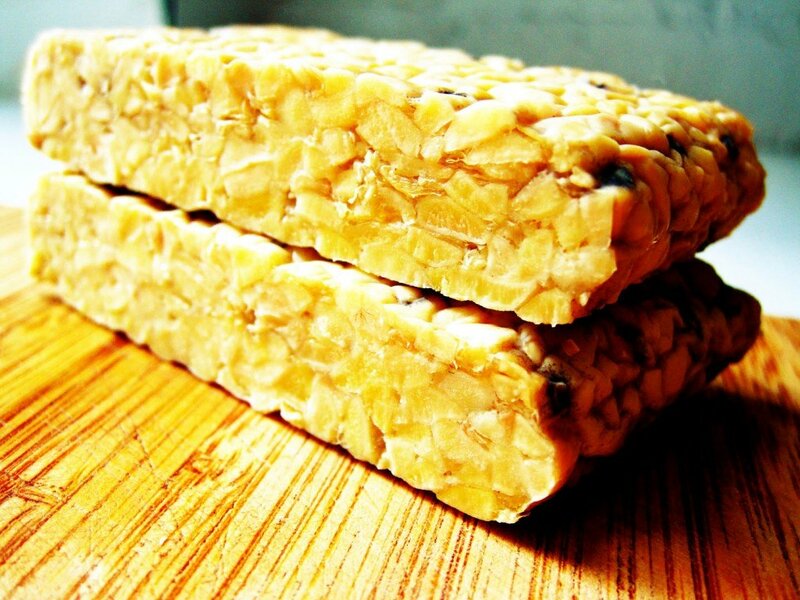 Tempeh is made of fermented soy, which is safe. Regular soy, however, is very controversial, and has many serious health downsides, which are worth looking into. Organic tempeh is far, far healthier than eating meat, and can be flavored to be an excellent meat-replacement to go along with your veggies. So, now that you know all this, how often will you be making the switch?